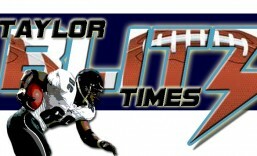 As the 90’s dawned we had a few teams that had been playoff staples during the 80’s and a few new teams coming of age. In the Buffalo Bills you had a team come of age as blue chip talent had been stockpiled in recent years. In the pre-free agent era you had to build a team through the draft. Just like the Pittsburgh Steelers and Dallas Cowboys of the 1970’s, the Bills sought to construct a champion brick by brick. Defensive End Bruce Smith and WR Andre Reed came aboard in 1985. Jim Kelly agreed to terms after the USFL dissolved in 1986. Linebackers Shane Conlan and Cornelius Bennett were added along with CB Nate Odomes joined ranks in ’87. Aggressive veteran SS Leonard Smith came in with 2nd round RB Thurman Thomas in ’88 as the Bills made the playoffs for the 1st time in 7 years. The ’88 season saw a 12-4 Bills team with the NFL’s #4 defense make it to the AFC Championship Game. Although they lost 21-10 to Cincinnati, they were definitely a team on the rise. Yet injuries and infighting nearly brought the team down in ’89 as they became known as the “Bickering Bills”. They only finished with a 9-7 record and lost 34-30 to Cleveland in an amazing divisional playoff game. However a light went on for the ultra conservative Bills offensively. In week 3 they fell behind big in Houston. Kelly brought the Bills back with a 5 TD performance, a 47-41 win. In his USFL days, Kelly ran a Run & Shoot with the Houston Gamblers and looked most comfortable playing this style with a No Huddle offense. They unveiled it late in the season and won the AFC East before falling to Cleveland. Alas Scott Norwood’s field goal sailed wide right and the best team the AFC had in years fell 20-19. 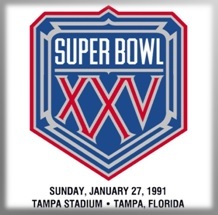 The only team to lose the NFL championship by 1 point. However the Bills were a young team in their prime and they would be back. They would go on to be one of the league’s most galvanized teams. The infighting of ’89 was in the distant past. Epilogue: When a long sought after quarterback finally joined the Bills in 1986, starved fans chanted for Jim Kelly to take the lowly Bills to the Super Bowl. 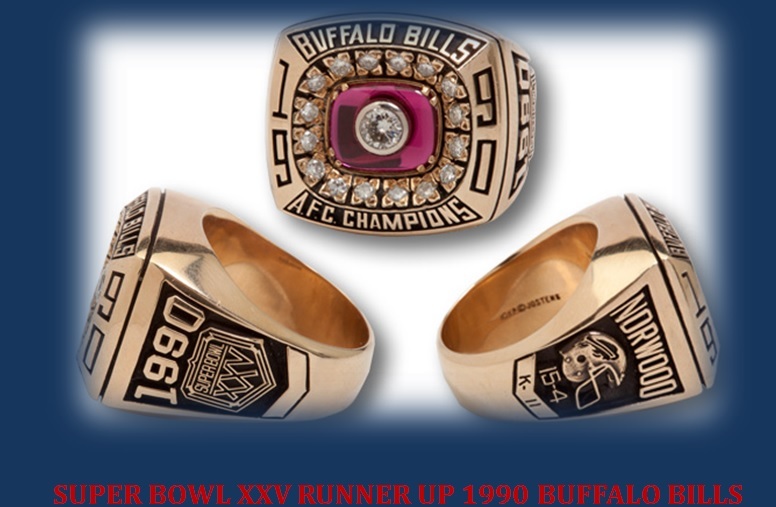 This entry was posted in Ring of Champions and tagged 1990 afc championship ring, 1990 Buffalo Bills, AFC, Bill Polian, Bruce Smith, Buffalo Bills, Corrnelius Bennett, Darryl Talley, James Lofton, Jim Kelly, Leonard Smith, Marv Levy, NFL History, Super Bowl XXV, Thurman Thomas. Bookmark the permalink.